Dip Into Our Noah's Ark Nursery Decorating Idea Bucket and Pull Out Some Great Inspiration, Decor and Noah's Ark Crib Bedding to Help You Create a Floating Wonderland in Your Nursery Room. If you want to bring the miraculous Bible stories of old alive to your little one, there's no better place to start than with a Noah's Ark nursery theme. A Noah's Ark nursery is perfect for a boy or a girl and it's fun and easy to create. Choose your nursery decor carefully and this is a nursery theme that can be quickly and easily stretched into toddlerhood. It's a great way for your little one to begin to learn the names of all the animals too. There are loads of beautiful Noah's Ark theme nursery decor options available on the market and it's easy to add your own special touches. From trumpeting elephants to thundering rhinos, there are plenty of imaginative ways to bring this floating miracle into your little one's nursery! You'll also find a boat load of nursery decorating ideas in the wide range of Noah's Ark baby room decor available on the market. From funky animal stickers to cute and cuddly soft toys, you'll find everything you need to decorate your Noah's Ark theme nursery at our Noah's Ark Nursery Theme Decor Store. 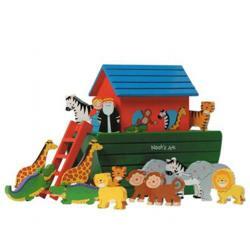 Or visit the Noah's Ark theme section at ababy.com. You'll find plenty of mix and match theme decor all in one place. Furniture, bedding, lighting, rugs and more. Everything you need to recreate Noah's Ark of old! Click here to go to the ababy.com Noah's Ark theme section. 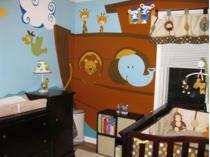 If you are decorating a Noah's Ark theme nursery enter it in our baby nursery photos contest here. You could win a great prize and we will add your nursery to this page to inspire other moms! Create a soft, peaceful nursery with pastels. Include blue, green, beige and yellow as a starting point. If you are decorating a nursery for a girl you can add pinks and lilacs to your color scheme. Try adding flamingos, pigs and butterflies. To create a more masculine nursery add in some browns and reds. How about some parrots and snakes? You can achieve a more modern look by using bright colors instead of pastels. Animals - two of each. A dove with an olive branch. You can easily add these items by painting or adding stickers to the baby nursery walls, or by incorporating them in parts of your decor such as drawer knobs or ceiling fan pulls. Add monkeys swinging from the roof of the ark. A leopard lazing on the roof. A lion lounging in the shade on the deck. A dolphin or two frolicking in the waves. An elephant squeezing through the door. A zebra poking its head through a porthole. A giraffe craning its neck. A parrot or two flying through the sky. If you want to create a nursery mural you'll need to decide which animals you want to include. If you don't feel up to painting the whole thing just paint the background and then add trees and animals using these gorgeous nursery stickers. You can't go wrong! You could also paint a smallish ark and have many pairs of small animals marching around the room towards the ark. Try making them out of salt dough using animal shaped cookie cutters and paint them with bright acrylic paints. Don't forget to paint a rainbow across the room. If you feel creative paint it across the ceiling. Add a sun smiling down. Another nursery decorating idea would be to stick glow in the dark stars to the ceiling to create an out-of-doors night sky. You can add your baby's name by painting it in the rainbow or the clouds. Or you could write your favorite Bible verses across the sky. Another great nursery decorating idea is to paint your animals and the ark all the same color as silhouettes. You can do this in almost any color. This is an idea that works really well for a modern Noah's Ark nursery. Try using blue and white or brown and cream. Animal prints also fit well in a Noah's Ark theme nursery. Think zebra, giraffe or leopard. If you don't want a full mural you could also paint animal spoor tracking around the room in a caramel brown color. Get a good book on African animals from the library and you should be able to find examples of different animal tracks. They're really easy to paint and a very effective way to bring the magic of Africa into your baby's room. Don't forget to cozy it up by adding lots of cute and cuddly soft animals. And last but not least, make sure you include some Bible stories on the bookshelf. What better way for your baby to go off to sleep each night than by listening to bible stories while perched on your knee?